Who do you call when your appliances stop working? If you live in the Marin, the answer is simple. 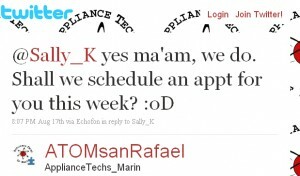 Call, Tweet or Email Appliance Techs of Marin! In less than a half an hour, I got the following response. I didn’t even have to pick up the phone! Who says Twitter is a waste of time? Mike from Appliance Techs of Marin came out that week and put in a brand new, quiet garbage disposal in no time. I was so impressed with their work I asked if I could interview them for my blog. Everybody needs an appliance tech at some point. 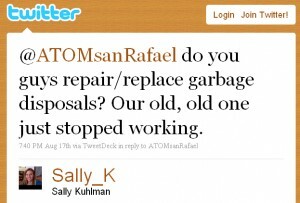 They do so much more than garbage disposals! Where is your favorite place to hike or bike in the Bay Area? Having a 6-day a week job doesn’t leave too much time for fun. So we consider ourselves little ‘homebodys’ who really enjoy our own neighborhood (Terra Linda/Marinwood) for both walking about, and the even-rarer, biking about. Very hard to balance work, our kids’ school & work schedules, and family obligations, with personal delights. What is your favorite restaurant in the Bay Area? This is probably the hardest question to answer, because there are SO many wonderful restaurants around. I guess it really depend on the ethnic dish we’re craving on any particular day. We do find ourselves going back quite often to Sol Food, Jennie Low’s, Fish, Roadside BBQ, Chipotle. The list goes on, but you get the idea. We are definitely bean lovers. Whole, not ground, please. Hold the sugar and ‘cream,’ but please add the Coffee-Mate … liberally. With so many variations of flavors & world regions they’re grown in, it’s actually quite fun trying a new one each time we run out of our latest pound of beans. We do explore a bit with different vendors, but gravitate more towards Peet’s because they’re local; home-grown right here in the Bay Area. The free medium drink offer when we buy a pound of coffee beans is always nice, too. What can we say .. Free is fun. And, supporting local business is really important to us. Although, we can’t cross tea off our list either. Hate to admit it, but we keep a box of Lipton’s cold-brew tea bags in the cupboard, because it’s the easiest to make, and the taste is always refreshing. Yep, we’ll have a glass of tea, hot or cold, plain or sweetened, with or without lemon, thank you. Loose tea is fun, lots of flavors, too, but waaay more work than we have time for. Favorite park for people and dogs? We love Point Isabel park in the East Bay, because we can bring our dog, Mala, along. It’s really big, and they have a fantastic view of the Bay; lots of trails to roam, picnic tables and benches along the way. It’s free, but you have to get really creative with parking sometimes. There’s also a doggy shower in case your pup decides to get dirty or jump in the Bay (there is a fee), and a little shop for drinks and what-nots. McInnis Park is another favorite park, because it’s local. Plus, we love visiting the Marin Humane Society’s dog park after regular hours, too. Mala loves being with the ‘pack’ and we love watching her play. It would have to be Moylan’s in Novato because they brew their own, and we’re really big on craft beer (especially since the last stronghold, Budweiser, sold out to a Belgium company). We like trying different microbrews; we follow Lagunitas Brewing Co. on Twitter so we know what’s currently brewing in the tanks. And, basically, any and all micro-breweries that are not so well known get a big thumbs up from us. We love the little guys! This is probably the category where we tend to go national, but really try to shop local wherever, whenever we can, even if it means spending a little bit more. For example, Ideal Stationers instead of Staples or Office Depot, that kind of thing. Craigslist is another favorite to shop from (For Sale categories we love include: free, clothes+accessories, furniture, materials, general, household, business, farm+garden). That website has been good to us; we’ve been able to sell & purchase several items. It’s fun to reduce-reuse-repurpose. What do you love most about the Bay Area? Fascinated with the micro-climates; absolutely love the stunning landscape of rolling hills, quaint towns, and picture-perfect water views of the San Francisco Bay; sports teams to watch and root for from every level of talent; innovative companies are born here; rock-n-roll legends are from here, play here, and live here; area farmers who share their goods with you and take time for conversation; and the best wineries and brew masters around! That’s what we love most about the Bay Area. Boy, that’s like a dying breed these days. Border’s was a favorite hang out, but lately the store feels like it has way more ‘open space’ instead of bookshelves.